Making friends with our courage begins with getting on a first-name basis with where we want to actually practice it. (And maybe where we don’t too). 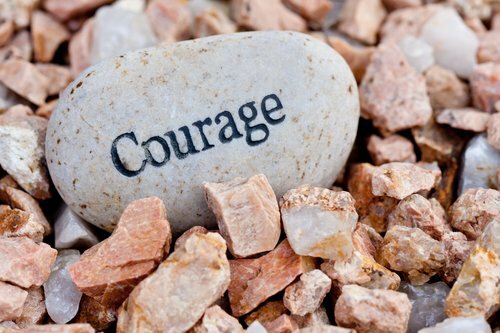 Simply put, naming our courage invites us to get really honest with ourselves. OUR EMOTIONS ARE SO MUCH MORE THAN HAPPY, SAD, ANGRY, OR STRESSED. Emotions do not ask to be ignored, dismissed, or denied. emotions ask to be named. Take a few moments to get still, close your eyes, settling into your chair or wherever you might be. Feel your feet pressing into the ground. Feel your body supported by the chair, couch, bed, etc. Take a few deep breaths, allowing what is holding you to actually hold you. Listen to your feelings & emotions. Allow all to rise within you. Resist nothing. Honor each emotion by recognizing it. Seek to feel rather than fix. Begin to name the emotions as they arise. One by one. What are their names? Name them aloud. Allow their names to be spoken aloud. Allow the emotion to move through — give it the time and space needed. Emotions are often deeply embedded — it will take time beyond these moments of practice to feel them through. Allow this. Return to this practice as often as you’d like to get honest with yourself about what you’re feeling and give it a name. Take a few more deep breaths. Center yourself back into your body, feeling the support beneath you. Write down what feelings are beginning to move through you. Share with a trusted confidante. Name the specific WAYS you want to be more courageous. Get as specific as you can. Jot them down in a place you’ll return to — a notebook, smartphone, journal, or mirror. What fears will you be looking in the eye as you practice this courage? Name these fears. How would greater courage in these area(s) serve you and your highest good? How would your practice of courage in these areas unwrap your potential? What contributions would you make? How would your relationships evolve? What vision do you hold for your life and how does practicing your courage in these areas bring this vision into reality? What is the cost to not practice your courage in these areas? start small. give yourself breathing space to build consistency. How specifically will you practice your courage in these areas? Name the awareness and actions needed to practice. Is this practice daily, weekly, etc.? What will it require of you? What specifically will be a marker of your progress? This doesn’t have to be labored; just get intentional. Who do you want to share this practice with for valuable accountability and support? How realistic is this practice? Anything you need to make it more do-able in your everyday life? When fear rises up as you practice, how will you respond with self-compassion and continue practicing? Choose one or two visible places in your life to write key notes from this exercise down. Get creative. Push yourself to bring these notes to life rather than just stored away in your smartphone or mind for a cloudy day. When we name our courage and put visibility behind our our practice, we build momentum beyond an initial decision. The decision becomes real too. Allow this visible reminder to give you an empowering nudge for every day of practice beyond today. So before you log out of this page or close your journal, make it visible. When we name something aloud, it becomes real. We become aware of it & honor it in a deeper way. THE NAMING PRACTICE is the beginning of shadow integration, a transformative practice of bringing the darkness of our lives into the light of our consciousness. When we are not aware of our shadows or deny their existence, we unconsciously give them fuel to direct our lives. The full practice of shadow integration brings these shadows forward into our awareness and diminishes their power over us and our lives. Shadow integration first originated from the research and work of Carl Jung and is an essential piece of our holistic development and our courageous practice. All life coaching clients here at TCP receive 1:1 shadow integration development and support as part of their coaching experience.